The Gemara (Shabbat 86b) records a disagreement between the Rabbanan and Rabbi Yosi as to the day of the month of Sivan that the Aseret ha-Dibrot were handed down at Sinai. The first opinion is that it occurred on the sixth of the month while Rabbi Yosi maintains that it occurred on the seventh. The Gemara goes on to explain that both agree on two matters: first, that the Bnai Yisrael arrived in the Sinai desert on the first of that month and, second, that the Torah was given on a Shabbat. They disagree, however, continues the Gemara, regarding on what day of the week did the first of the month fall, on a Sunday (in which case the Torah was given on the seventh of the month) or on a Monday (in which case the Torah was given on the sixth). 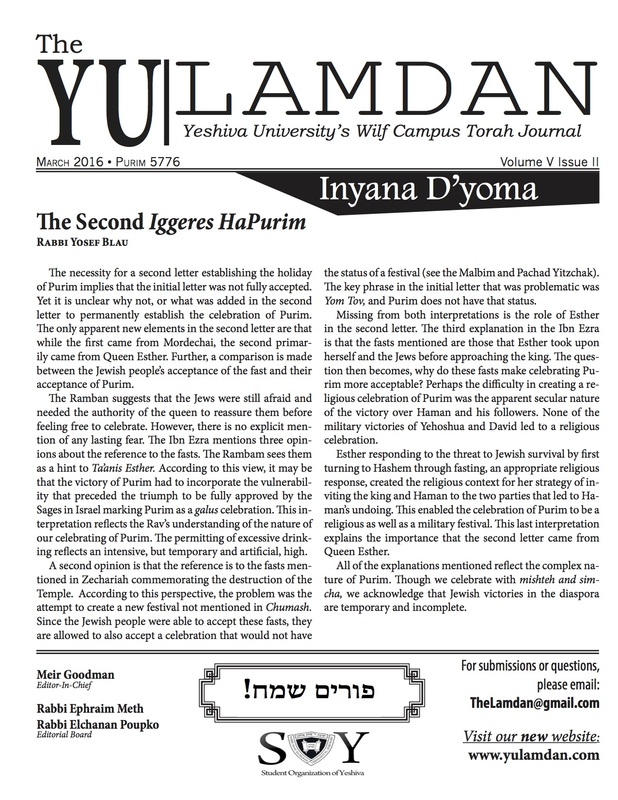 A second Gemara. The Gemara (Shabbat 87b) informs us that the Bnai Yisrael left Egypt on a Thursday. A third Gemara. The Gemara (Pesachim 68b) simply assumes that the holiday of Shavuot commemorates the day of the giving of the Torah. This is not self-evident because the Torah refers to this holiday four times and not once makes this association. In Shemot 23:16 it is referred to as “chag ha-asif,” in Shemot 34:22 as “chag shavuot,” in Bamidbar 28:26 as “yom ha-bikkurim,” and in Devarim 15:9, 16 as “chag shavuot.” Nowhere does the Torah associate this holiday with the event of Revelation, an association that became self-evident in later rabbinic literature. Indeed, in his biblical commentary on Vayikra 23, the Abravanel wonders (question #17) why the Torah does not explicitly make this connection, and he is only one of many who address this issue. And a pasuk. The Torah (Vayikra 23:15-21) tells us that fiftieth day from the beginning of the counting of the omer is a holiday and the clear assumption in Jewish tradition is that this is a reference to the holiday of Shavuot. Given these facts, we are in a position to understand and appreciate a powerful question posed by R. Avraham Gumbiner in his Magen Avraham commentary to the Shulchan Aruch (Orach Chayyim #494:beginning). He points out that that not all of these facts can coexist. If Bnai Yisrael left Egypt on a Thursday, then the counting of the omer would begin on a Friday (“mimacharat ha-shabbat” in Vayikra 23:15 is understood to mean the omer count begins on the second day of the holiday). If, then, day one of that count was a Friday, then day fifty falls on a Friday and, thus, Shabbat, the day the Torah was given, turns out to have been the fifty-first day of the counting of the omer! (The Maharsha in his commentary on Avodah Zarah 3a, s.v. yom ha-shishi, asks the identical question.) Shavuot, thus, is celebrated one day before the anniversary of kabbalat ha-Torah. Furthermore, the answer suggested by the Magen Avraham in the name of the Asarah Ma’amarot (Rabbi Menahem Azariah of Fano) is problematic. In his view, this fact, that the Torah was given on the fifty-first day of the counting of the omer is meant to draw our attention to yom tov sheni shel galuyot, the power of keeping the second day of the holiday (the first day of the holiday is, indeed, on the fiftieth day of the count and the second day is the fifty-first). But already Rabbi Yaakov Reischer pointed out in his Chok Yaakov commentary there (Orach Chayyim 494:1) that this answer is “wonderous” (tamuah) because how is it possible that the second day, instituted only in the Diaspora, should be the primary day of the celebration and, anyway, what about the practice in Israel when only one day is celebrated. This would mean that the holiday would be concluded by the time the anniversary of the giving of the Torah would have arrived! A fourth, and final, Gemara, and a second question. The Gemara (Rosh Hashanah 6b) cites in the name of Rabbi Shemayah that Atzeret (one of the biblical names for the holiday of Shavuot) can occur either on the fifth of the month of Sivan, the sixth or the seventh. It explains that before the calendar was fixed, any given month could conceivably have either twenty-nine or thirty days, depending on when witnesses would come to bet din and testify that they saw the sliver of the new moon. If both months of Nissan and Iyyar have thirty days (they are both malei), the fiftieth day of the omer counting, and hence the holiday of Shavuot, would be on the seventh day of the month; if both are twenty nine days (both chaser), it would fall on the fifth and if one is twenty nine days and the other thirty, it would fall on the sixth. But the question is obvious and is found in a number of rabbinic sources (see, for example, Minchat Chinuch, Mitzvah 309:1; She’elot u-Teshuvot Oneg Yom Tov #42, s.v. ve-nir’eh mishum). How is it possible to observe Shavuot on the fifth of the month if, according to either the Rabbanan or Rabbi Yosi, nothing occurred that day. Shavuot will come and go and will be concluded before the anniversary of kabbalat ha-Torah according to any opinion! In the formulation of the Rivash (She’elot u-Teshuvot Rivash #96), if Nissan is thirty days, why would it be necessary to wait for witnesses to determine the length of Iyyar? Clearly it must be twenty nine days because if it, too, was thirty days, then Shavuot would fall on the fifth of Sivan, before the anniversary of kabbalat ha-Torah! Rabbi Yechezkel Landau suggests (Tzelach, Pesachim 68b, s.v. hakol modim) that the fifth day of Sivan is, in fact, very significant because it was on that day that the Bnai Yisrael declared na’aseh ve-nishma (Shemot 24:7) and committed themselves to observe the Torah. Therefore, he writes, all three days – the fifth, sixth, and seventh – are called “matan Torah” and, as a result, it is appropriate to consider Shavuot as commemorating that event regardless of on which of those three days it may be observed. But I have a different suggestion to answer both questions. To review: 1) Shavuot is observed on the fiftieth day of the counting of the omer but the year the Jews received the Torah that event occurred on what would be the fifty-first day of the omer (Magen Avraham, Maharsha). Shavuot is thus observed before the anniversary of kabbalat ha-Torah; 2) How is it possible for Shavuot to be observed on the fifth of the month if the earliest the Torah could have been given was the sixth of the month (Minchat Chinuch, Oneg Yom Tov, Rivash)? To me the answer is clear, and somewhat radical. In fact Shavuot does not celebrate the receiving of the Torah; it celebrates preparing to receive the Torah. It is celebrated, davka, on the day before the giving of the Torah – on the fiftieth day of the counting of the omer and not on the fifty-first when the Torah was actually given; celebrated possibly on the fifth of Sivan and not on the sixth or seventh of that month – to highlight the power of preparation. Celebrating a commitment to Torah is not focused on one day only, on the day it was given; it is focused on preparing to receive the Torah, and this preparation takes an entire lifetime (see Sefat Emet, Parshat Ha’azinu, 1874, s.v. be-tur heivi). Rabbi Schacter is co-author of the award-winning “A Modern Heretic and a Traditional Community: Mordecai M. Kaplan, Orthodoxy and American Judaism” published by Columbia University Press in 1996; author of “The Lord is Righteous in All His Ways: Reflections on the Tish‘ah be-Av Kinot by Rabbi Joseph B. Soloveitchik” (2006); and close to 50 articles and reviews. He is founding editor of The Torah u-Madda Journal, a prestigious academic publication which has gained international acclaim.